Element and Metadata Definitions for the SDTI-CP (Revision of SMPTE 331M-2004). This standard specifies the formats of the elements and metadata used by the SDTI content package format standard (SDTI-CP). This standard defines element and metadata formats where they are simply specified or where a publicly available reference is available. 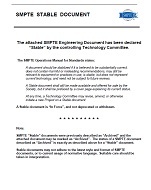 It is not intended that this document provide detailed specifications for complex formats which may have broader application.